Actress Claire Danes stars as Carrie Mathieson, a CIA officer wrestling with bipolar disorder, in the hit Showtime thriller series "Homeland." In this week's Sunday Sitdown, Danes, who recently announced she is pregnant with her second child with husband Hugh Dancy, talks to Willie Geist about how the show's storylines seem to foreshadow real-life events and what her plans are when the show eventually wraps up. Click here to listen to Willie's full interview with Claire Danes on the "Sunday Sitdown" podcast. According to a recent survey, 41 percent of Americans and 66 percent of millennials could not say what Auschwitz was. In this week's Sunday Spotlight, NBC's Harry Smith meets Steve Ross, an author who survived 10 concentration camps and doesn't want the memory of the Holocaust to fade away. Lawson Craddock, a 26-year-old American cyclist, is expected to finish this year's Tour de France in last place after a devastating crash. While this comes as a tough blow, Craddock has been able to raise tens of thousands of dollars to help rebuild the track that started his journey with cycling. NBC's Kelly Cobiella has this week's Sunday Closer. 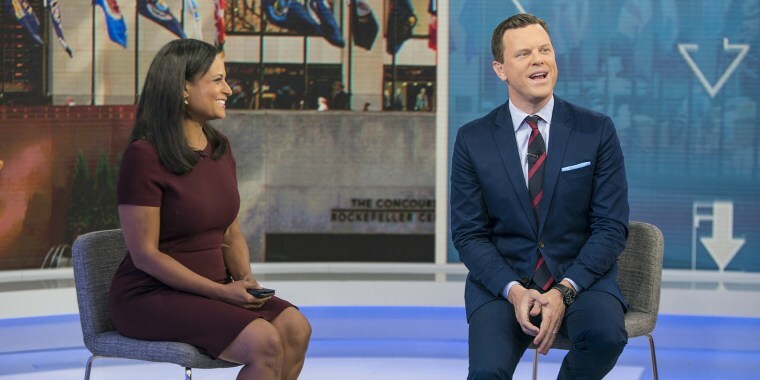 Sunday TODAY's Willie Geist and Kristen Welker run through the Highs and Lows of the week, including the Florida police officer who helped a homeless clean up before a job interview by shaving his beard, Donald Trump Jr. and Robert Mueller crossing paths at a D.C. airport without knowing it, and one woman's chaotic attempt to cook crabs for dinner. Since a young age, Dr. Lincoln Brower has been fascinated by monarch butterflies. Through his life's work, he was also able to gain the world's fascination of the orange and black insect. With his enthusiasm and expertise, he helped set up sanctuaries for the butterflies as they instinctually migrate to Mexico. Brower died last week at age 86. Sunday TODAY's Willie Geist remembers a life well lived. Willie Geist wraps up Sunday TODAY with a look at the week ahead, including President Donald Trump holding a rally on Tuesday in Tampa, Florida, stumping for Republican gubernatorial candidate Ron DeSantis. And on Friday, the boys of the Thai soccer team who were rescued after more than two weeks trapped in a cave will leave a monastery as ordained, novice Buddhist monks. And head over to Willie's Facebook page to see this week's Facebook Live chat!